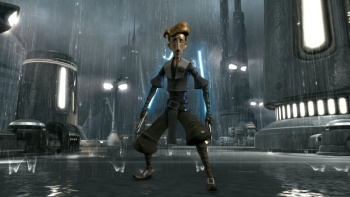 Meet Guybrush Threepwood, Mighty ... Jedi Knight? No, the image you see here to the right has not been Photoshopped (at least, not significantly). You do in fact see Monkey Island's erstwhile lovable loser Guybrush Threepwood wearing Jedi robes and dual-wielding lightsabers. Lucasarts revealed via Facebook that Guybrush will be an unlockable skin for playable character Starkiller in the upcoming Force Unleashed II. There is no word on exactly what it will take to get Guybrush to trade in his cutlass for a lightsaber, but I think we can all agree that the simple premise alone is pretty darn rockin'. In case anyone is scratching their heads in confusion, Lucasarts' legendary adventure game studio was the birthplace of many game series including Monkey Island. So Guybrush and the Jedi have always been distant brethren of a sort - now it's just a bit more official. Unfortunately, "You fight like a nerf herder" just doesn't have the same ring to it.